So I decided to do a temporary chalkboard addition. 5. Cut it out, removed the backing & placed on the platter. When I’m done with my chalkboard phase – I’ll still have my lovely platter – just peel & toss! and I just love, love this image! Okay... I guess this means I'm gonna add one more chalkboard to my ever growing collection! Thanks for the contact paper idea. What a great idea! I would have never thought of it! Thanks for sharing the non permanent idea. I'll have to give that a try. Great idea....thank you for sharing...I have to try this one! Great job! Smart idea to use the contact paper too. 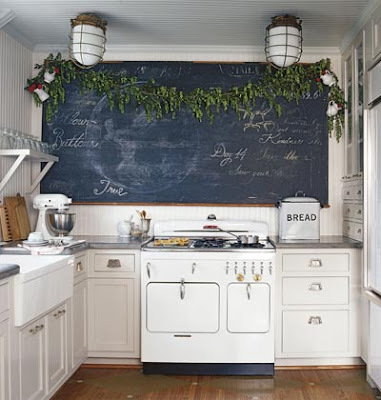 I LOVE that Cottage Living enormous chalkboard. I have chalkboards everywhere....pantry door, on the kitchen counter, big one in the living room...so much fun! Great job! What is with all your anonymous comments though? Looks like someone is trying to spam you - ack! Great, great, great idea. I'm going to try that one and I love chalkboards too. That is awesome! I didnt know you could spray paint on the contact paper! I love the temporary-ness of it! Thanks for sharing that great idea! I love your idea! I was just looking at a platter and thinking what a great chalkboard it would be, but wasn't sure I wanted to commit it to that! I'm so doing your version! Thanks! Stop by and visit me sometime! I almost fainted when I thought you permanently attached a chalkboard to that beautiful platter! LOL As a food blogger, as well as a craft blogger, finds like that lovely platter make for excellent food photo props :-D I'm glad you made it removable so you could enjoy it later, the chalkboard is fabulous! This is the spray paint chalkboard paint? and you just follow the instructions for how many coats? and it doesn't crack!! You are fabulous! I am now a follower! very clever. I love how temporary it is. Very clever idea! This may be the way to bring a chalkboard into my kitchen that I've been searching for! Very smart! I love crafts that are reversible. It adds a cute touch too! That is awesome! And I love those inspiration pictures too! How cool is that kitchen! What a great idea! I never would have thought to paint the contact paper. Love it! What a clever idea using the contact paper. Your chalkboard platter turned out great! Thx for the contact paper idea! I snagged a great big oval mirror in a frame that I want to paint and do chalkboard on the mirror but wondered if someday I might want the mirror back...your contact paper idea solves this dilemma!